Escape to an island paradise steeped in rich cultural and traditional Hawaiian customs when you stay at The Ritz-Carlton Kapalua. From the moment guests arrive at our breathtaking Maui resort, they are enveloped in captivating surroundings featuring lush flora and greeted with a warm Aloha reception with a Kukui Nut Lei. With direct access to the secluded, award-winning D.T. Fleming Beach, guests of the luxury Maui hotel can relax in the sun, or connect with the natural, tropical environment through hiking, snorkeling and a variety of other outdoor activities. From tropical rainforest hikes to authentic Hawaiian cultural experiences, let us help create an unforgettable Maui escape that offers impeccable service and luxurious resort amenities in a breathtaking Hawaiian setting. Whether your ideal vacation is appreciating the natural beauty of the island of Hawaii, discovering the fascinating local customs or rejuvenating your senses at The Ritz-Carlton Spa®, Kapalua, our world-renowned Maui resort is sure to delight. Bringing the spirit of the islands indoors at our oceanfront hotel. 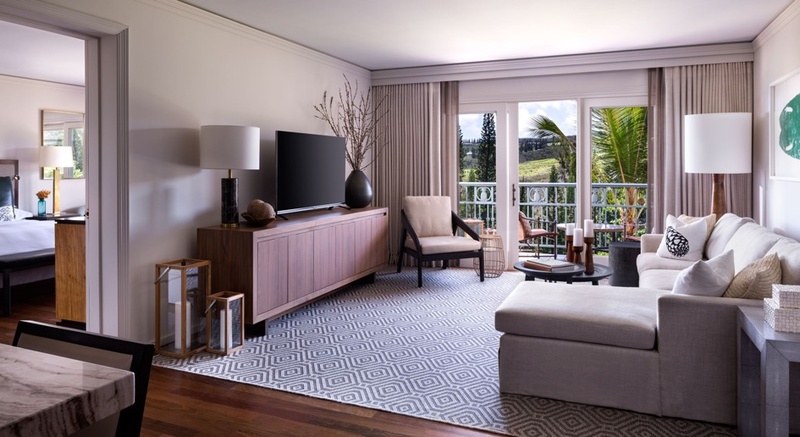 Escape to award-winning luxury in the spirit of aloha at The Ritz-Carlton, Kapalua, Maui. Our exclusive oceanfront hotel captures the essence of island hospitality combined with rich resort amenities. Guest rooms and hotel suites featuring dark floors, marble bathrooms and island-inspired décor provide luxurious accommodations, while our Club Level offers exclusive amenities for a truly remarkable hotel experience. Our luxury hotel suites and guest rooms offer stunning views of the lush foliage and soothing ocean waves, access to our restorative spa and fitness center, and a chance to lose yourself in the tranquility and beauty of our island paradise. Surrounded by natural beauty, our Kapalua beach hotel offers activities on land, air and sea. This legendary Maui Lahaina hotel is located on the western edge of the island, a paradise Hawaiians call the “Island of the Sun.” Kapalua can be loosely translated as “arms embracing the sea,” which refers to the Maui resort’s dramatic lava peninsulas. Combine nature’s playground, various golf courses, and a host of recreational activities on land, in the air and in the water, you’ll soon discover that there’s no shortage of things to do in Maui or Lahaina when you stay at our luxury Kapalua resort. Explore beautiful white-sand beaches, mountain springs and captivating surroundings that make up this island paradise. From hiking and biking to snorkeling and parasailing in Maui, an array of land and water activities are just steps away from our world-renowned Kapalua beach hotel. Restore well-being at our rejuvenating resort and spa. Indulge in the healing powers of Waihua – the name ancient Hawaiians gave to water that is pure in every sense at our luxury spa resort in Maui. Inspired by the spirit, The Ritz-Carlton Spa, Kapalua offers a variety of treatments and therapies, based on native Hawaiian healing and the potent plants, flowers, fruits and herbs abundant in the islands. Allow time-honored remedies to alleviate modern ailments at our luxury resort’s newly-transformed Maui spa. Relax with a Lomilomi massage. Add vibrancy to your skin with a refreshing facial. Relieve stress and tension with one of our spa’s hot-stone Lomilomi massages. This luxurious 17,500 square-foot spa and fitness center offers private outdoor gardens, as well as new spacious and private couples cabanas. Rekindle your spirit and restore balance to your mind, body and soul at our soothing Maui resort and spa. Experience a relaxing Hawaiian spa vacation at The Ritz-Carlton Spa, Kapalua, a premier destination and extraordinary hideaway. As Jean-Michel Cousteau says, “All kids start out as scientists, constantly asking ‘Why? What’s that? How does it work?’” Ritz Kids resort experiences tap into that innate curiosity by introducing our youngest guests to both the natural wonders and the rich cultural traditions of our resort locations. Immersive and adventurous, the resort experiences provide your child with enthralling activities to reward their interest in the beauty and workings of the world we live in. With a diverse collection of activities based on the four pillars of the program – water, land, environmental responsibility and culture – kids are swept away by everything from coral reefs and forests, to recycling and sustainability, storytelling, art and even food. Programs available for ages 5 years and older through Jean-Michel Cousteau’s Ambassadors of the Environment. Capture the magic of Hawaii with a remarkable Maui wedding experience. The Ritz-Carlton, Kapalua specializes in creating unforgettable wedding ceremonies and receptions in Hawaii. From intimate destination weddings with breathtaking views to elaborate ballroom celebrations with elegant décor, our luxury hotel provides the perfect destination for your dream wedding in Hawaii. Let us help create your once-in-a-lifetime wedding celebration with personalized service and luxurious accommodations.